When Miri Duncan gets released from prison just in time for Christmas, she has only one goal: to deliver the best Christmas gift ever to her sister, Sophy, in Copper Lake, Georgia. But Texas private investigator Dean Montgomery has been hired to recover the money Miri embezzled, and he's not about to let her out of his sight, especially after rescuing her from two thugs hours after her release. Miri's not giving back the money. She paid for it with her months in jail. And she's not planning to forgive Dean, either, for his role in her arrest. But she'll accept his help in getting to Georgia and the sister she hasn't seen in twenty years . . . if they manage to live that long. 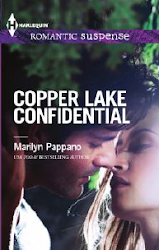 Macy Howard left Copper Lake amidst scandal eighteen months ago with her little girl, a broken heart and wounded spirit. Now it's time to move on with her life, which means facing the town and the home she'd fled. Returning is hard, and she can't help but wonder if she's up to the challenge. Vet Stephen Noble is intrigued by the new woman down the street. Nerd by birth and part-time epic fantasy author by choice, he can't help but be drawn to Macy. Deep inside her, he's convinced, is a Warrior Woman with all the courage and strength that implies, but closer to the surface is fragility and vulnerability. He needs to take care of her . . . protect her . . . love her. But first they have to figure out: is Macy going crazy - again? Or is someone trying to make them think so? And is it her money they want? Her daughter? Or her life? The Tuesday Night Margarita Club is the most exclusive club in Tallgrass, Oklahoma. Its members meet once a week for dinner, drinks and conversation, and they chose to name themselves to avoid the obvious name that other people call them. The Fort Murphy Widows' Club. These women have all lost their husbands to war. In a town like Tallgrass, which is military to its core, it's hard to forget the loss. Some drown their pain in partying, others in work. But they never imagine new love might be the true cure. Third-grade teacher Carly Lowry lost her purpose in life when she lost her husband, Jeff. She's living in limbo . . . until she meets Staff Sergeant Dane Clark. Dane's life has taken an unimaginable turn, as well. His marriage ended in divorce, and now even the Army career that he's committed so much to - sacrificed so much for - is in jeopardy. When he meets the pretty Carly - in a cave, of all places - he finds hope for the first time since leaving a part of himself on an Afghan battlefield. But do the war hero and the war widow have the courage to take another chance on love? Can't wait. Sounds like your goal is right on target. Yay, you. Yay, us. Hello Ms Pappano. Just finished Scandal in Copper Lake. Is Anamaria's sister Charlotte featured in subsequent books? Hi, Adrian. I just turned in a proposal a week or two ago for Charlotte's story. I haven't heard back from my editor yet, and I'll be writing the second Tuesday Night Margarita Club book in the meantime, but yep, Charlotte's coming! Just finished Christmas Confidential. Is Sophy getting a story, too? And Charlotte's story is done! COPPER LAKE ENCOUNTER will be out in August 2013. The hero is detective Ty Gadney, who first appeared in PROTECTOR'S TEMPTATION and is currently one of my favorite of my heroes! Sheri, I'm working on the proposal for Sophy's story now. I've known for several years that she was going to wind up with Sean Holigan -- one of those kids who ran wild with Rick, Russ and Robbie when they were teenagers -- but now I've finally got the plot pretty much figured out. Thank you so much for the update. Just bought a copy of Protector's Temptation so will be prepared for the August installment. I CAN'T WAIT for the Margarita Club books to come out. I've been looking forward to them since the retreat. LOL! Wonder if I'm the first person to practice a pitch in her sleep??? I'm anxious to hold that first one in my hands. You'd think after this long, it would become old hat, but every book thrills me. I am so excited that you are starting another series. I just loved the Bethlehem books, they remain among my all time favorites. I saw A Hero to Come Home To and wondered if it was a reissue or new. I am really happy to have it to look forward to. Thanks a bunch! The Tallgrass/Tuesday Night Margarita Club series has been great. Since the heroines are young widows, it's emotionally tough, but I love the characters, the town, the situations. I love small towns, the military and Oklahoma, so I'm having a lot of fun with the books. Just finished A Heto To Come Home To. Loved it. I can't wait for the next book. Please don't make us wait too long. Thanks.